One day tour in Maramures. Get to know "The land of wood" with a qualified tour guide. Is it possible to feel and "taste" the real "flavor" of the villages? The answer is absolutely YES. […] “The tourists who come here have already seen half the planet,” local guide Cornelia Lupsa had told me earlier, as we’d set out for the countryside from the industrial town of Baia Mare, whose station my overnight train from Bucharest had trundled into just after dawn. “They’re sick of big squares, hundreds of tourists taking photos. 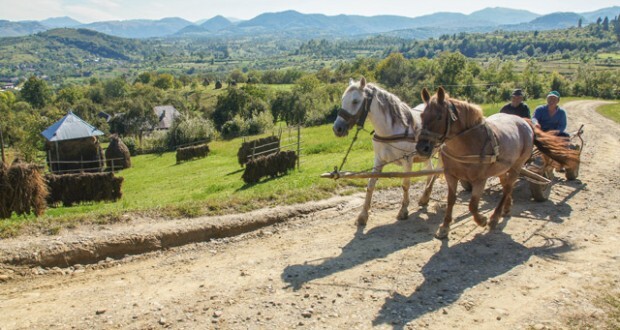 They want something simpler.” Maramures, then, is a refuge for travellers seeking a break from the modern world.My base for exploring the region is Breb, a chocolate-box village surrounded by forested hills, 17 miles shy of the Ukrainian border, where Englishman Duncan and wife Penny opened The Village Hotel in 2014. When we arrive, a dozen clucking hens scramble from our path as Cornelia’s car jolts over the ruts in the road. The first, Budesti, is a picture of rural calm when I freewheel in; its courtyards piled high with pumpkins and firewood. The only activity comes from a roadside wood shop where three men have formed a carpentry production line: one splitting the wood with a hatchet, another shaving the pieces into oblong shards, the last cutting in the ornamental taper at the tip and chucking them onto a pile at his feet. The resulting ‘shingles’ are the roofing material that gives Maramures’ wooden homes their special character. The apotheosis of this style was just around the corner. Budesti’s wooden church sits on forested hill within a cemetery of metal crosses, the most recent piled high with garlands of plastic flowers. Although most local services now take place in more modern churches, these timber chapels remain at the spiritual and geographical heart of the Maramures village. This one in Budesti — among eight designated World Heritage Sites by UNESCO — has stood since the mid-17th century; sturdy yet delicate, with oak-beam walls and thousands of shingles covering the double eaves and spire, greyed and frayed by age. Typically, for the benefit of curious visitors, a sheet of A4 is tacked near the door with the phone number of a key-holder. Today, I’m in luck — she’s already here. The door swings open onto a dark room lit by small windows and a single chandelier. The floor is piled with gaudy woollen carpets, and on the wall, above the modest altar, is a pantheon of flaking haloed icons. By the door, a frame contains a helmet and chainmail vest that once belonged to the beloved outlaw Pintea the Brave, Maramures’ own Robin Hood — a legendary hero for a fairytale building. It’s tempting, of course, for an urbanite to over-romanticise such rustic places, but on one morning excursion with Cornelia I get a poignant reminder that behind this folksy, preindustrial Eden lurks a long history of hardship. Sighetu Marmatiei (or ‘Sighet’) is a town of 40,000 tucked up against the Ukraine border. Down a pedestrianised road, where fountains chuckle outside quiet coffee shops, we enter a building with a sinister past. The Memorial of the Victims of Communism and of the Resistance was once a prison. It was here that many of the country’s intellectual elite were jailed and exterminated during ‘Romania’s 45 years of darkness, 1945-1989’, as a banner on a wall display puts it. Over two floors, the story of decades of communist repression is retold in the former cells. We learn of Nicolae Ceausescu’s villainous cult of personality, and the Danube-Black Sea Canal, known as the ‘graveyard of the Romanian bourgeoisie’ — a reference to the over 200,000 regime opponents who perished while being used as forced labour during its construction. Only the windowless punishment cells required no description, containing nothing but a single manacle spot-lit on the floor. It says much for the resilience of Maramures’ singular culture that its way of life survived the communist era, during which the land was collectivised and the pervasive brand of Christianity practised in its wooden churches suppressed. Ten miles west of Sighet, the uniqueness of Sapanta’s ‘Merry Cemetery’ seems a poetic two-fingered salute to Ceausescu’s ambition to create a culturally homogenous ‘Greater Romania’. What began 80 years ago as a solitary headstone-maker’s act of eccentricity has evolved into this region’s most celebrated tourist attraction — two coachloads of Italian tourists are here when we arrive, weaving through the 600 or so blue oak crosses with their cartoonish depictions of the deceased as they were in life — holding a scythe, down a mine, in nurse’s garb — together with a few lines of doggerel on how they lived, how they shuffled off this mortal coil, and who they left behind. Yet for all the wry humour and defiant, peasant’s fatalism expressed on the crosses there’s also much melancholy. “Please cry for me mother as long as you shall live,” translates Cornelia, reading the heart-wrenching inscription beneath the image of a child falling beneath the wheels of a train waggon. Another shows a hapless man being decapitated by some ‘bad Hungarians’. On the way back to Breb, it’s tempting to see echoes of the hardships portrayed in those naïve drawings in the scenes we pass at the roadside. Most of the people toiling in the fields are old — too old, surely, for such unforgiving labour. On one hilltop, the sight of a disabled farmer struggling to wield a 20ft stick as he scrumps apples is a sobering symbol of rural tribulation. Outside many of the houses stand ‘pot trees’, their trunks stripped of bark and their bare branches hung with brightly coloured pots and pans. According to local custom, such a display serves to give notice that a girl of marriageable age resides in the house. But most are merely ornamental now — memorials to a time before the exodus of many of the youngsters to the towns. Successful émigrés who return often proclaim their newfound wealth by building large holiday homes in their hometown, many of them out of keeping with the region’s traditional architecture. Maramures is here and you are invited! Maramures – “The country of wooden churches” seems to be a living history. The landscape is fabulous, villages are charming because of their simplicity and ancient traditions. People are facinating and I can promise you that Maramures will be love at first sight. We are honored to invite you in Maramures to see its beauty, to meet the people, to breathe its air and feel the pulse of the villages, to find out its history and discover its creative spirit. Maramures could be also your adventure destination for hiking, climbing, cycling, motorcycling and offroading. We are licensed tour guides, English speakers. We have been home just a few days and we think of you often. It is hard to put into words how very much we appreciate the wonderful gift you gave us through our time we spent together in Maramures. Friends have asked about our trip and we always start by trying to describe the magic that we felt while in Maramures. It is like no other place to which we have traveled. All countries have great museums of which they are proud, of wonderful architecture to be photographed, of interesting history to be told, and of nature of great beauty. Indeed Romania has all of that . But it has something that the other places we visited do not have. You have Maramures. Of course, we appreciated the trip to the museum in Sighetu Marmatiei and the Merry Sapanta Cemetery. And we were amazed by the beautiful UNESCO wooden churches. But what makes Maramures so special is the people. We deeply appreciate the contact you helped us make with people along the way. The woodcarver so proud to share his work. The woman who patiently showed us how she turned hemp into cloth and went to put on her wedding jacket for our photo together. The gentleman who brought the key to the church in Ieud so proud to do so when you called. And being able to stop along the road to watch the farmers gather in their potatoes or stack piles of wood on their carts. It is a place like no other. Someone on the plane coming home asked where we had been. When I told him, he replied “Romania? Why would you go there? It is so poor!” But indeed, we do not believe that at all. We believe that Romania has a richness to it that is invaluable. The people. Come and discover yourself if Christina and Stephen were right. Book now a private tour.